Moroccan lamb and pumpkin salad | Easy, healthy dinner recipe! Far out this recipe is a complete winner! It’s about time we start sharing some epic dinner recipes (sweet treat overload!). 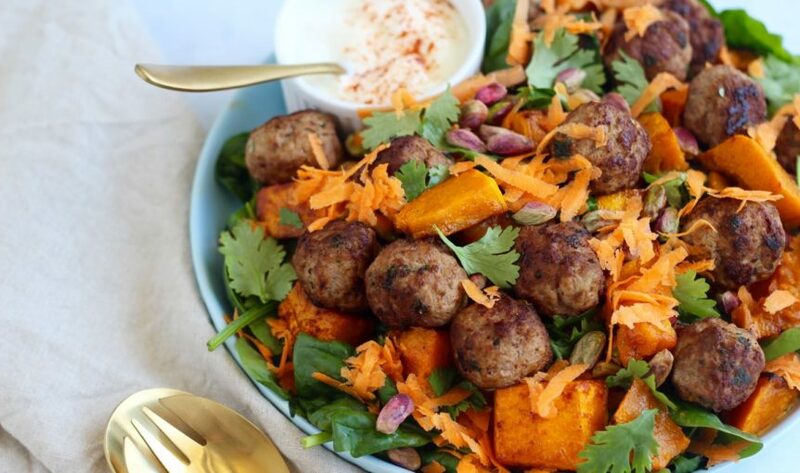 This Moroccan lamb and pumpkin salad recipe is all kinds of easy, yum and healthy! It’s one of the epic recipes included in our #GetMerry Challenge! 21 days to start your new year in the best way possible. To create the momentum to make 2017 YOUR year. It’s not just 21 days of healthy recipes and meal plans. It’s 21 days of support, motivation and learning. You’ll connect with 100s of like-minded people with similar goals. During the 21 days we’re also running a live online health summit! You’ll hear from 15 epic experts in health, wellness and happiness… get ready to be inspired and learn everything you need to know. It all begins on the January 9 and we say stuff the diets and guilt trips… #GetMerry instead. Get all the info and join HERE! Oh and if you have a bestie to join up with check out the special deal! Besties make everything better BUT if you don’t have anyone to join with… be prepared to make new friends. PLUS: We’re running an early bird special! Save another $16 to say toodle-loo 2016! During the challenge, you’ll get 45 quick, easy and delish recipes just like this Moroccan lamb and pumpkin salad recipe. So freaking yum! And easy as to make. Boooooom! P.s Don’t forget to check out the #GetMerry Challenge epicness! Preheat the oven to 180°C (355°F) and line a baking tray with baking paper. Lay the pumpkin cubes on the tray, drizzle with coconut oil. Sprinkle with paprika and a little salt and pepper. Place into the oven for about 30 minutes. Meanwhile get onto the meatballs. In a large bowl place all the ingredients, except the oil and mix super well. You might have to get your hands in there! Use a tablespoon to measure and roll out small meatballs. You will make about 20 or so meatballs. In a frypan on high heat add a little oil and cook the meatballs. Turning to ensure all sides brown and the balls are cooked through. Once cooked, place on a plate and cover with foil to keep warm. To make the dressing simply mix the olive oil, apple cider vinegar and lemon in a bowl or jar. Leave for now. Make the salad on a large platter (or a bowl), start with the spinach and carrot. Top with the pumpkin, meatballs, drizzle with the dressing and serve with yoghurt and nuts. Far out this salad rocks! Swap the pumpkin to tomatoes and cucumber if you can’t be bothered to turn the oven on. We all have those days!